IN 1925 just after the Scopes trial, social critic H. L. Mencken wrote with typical flair, “Heave an egg out a Pullman window, and you will hit a fundamentalist anywhere in the United States"—a comment implying that fundamentalism was a large and monolithic movement. But who exactly were the objects of this imaginary egg? One characteristic common to all fundamentalists was a militant opposition to modernism—which made fundamentalism as diverse as the modernism it opposed. Some fundamentalists objected primarily to the liberal understanding of the kingdom of God—the idea that Western civilization was establishing Christ’s earthly rule. Others found evolutionary teaching most reprehensible. Others still were troubled by the increasing cultural disarray in the United States. Still other fundamentalists identified biblical criticism as the chief culprit. In spite of the complexity of the movement, though, it is possible to see three major strands in fundamentalismand each is exemplified in the life and ministry of a fundamentalist leader. 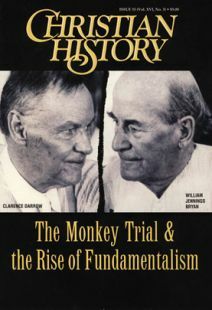 Many people think early fundamentalists withdrew from social and political concerns. But a closer look reveals that many prominent fundamentalists denounced the social engineering of liberal Protestants while promoting their own solutions for American society. One such minister was John Roach Straton. Straton’s interest in social reform was not rhetorical. In New York and at previous pastorates, he visited red-light districts, where he led protests against prostitution; he was a strong advocate of Prohibition, and he promoted a variety of economic reforms (e.g., the minimum wage, pensions for mothers, and profit-sharing) that he believed would equitably distribute wealth and thereby take away the appeal of many vices. His most celebrated defense of fundamentalism came in a series of debates he conducted in 1923 and 1924 with Charles Francis Potter, a Unitarian minister in New York. Not only were they broadcast on the new medium of radio, but major newspapers gave front-page coverage, and later the debates were published in book form. “The very foundations of the American Republic were laid down upon the open Bible.” This book taught nations “the value of monogamy, the sacredness of the marriage vow, the religious equality of the sexes, and the sanctity of the home.” To Straton, the well-being of the United States depended on the continuing acceptance of Christianity. Bible institutes and schools, like Moody Bible Institute in Chicago and Philadelphia College of the Bible, arose in the late nineteenth and early twentieth centuries to train Christian workers for evangelism and missions—and to provide an alternative to America’s liberal-leaning colleges and seminaries. Bible schools were also important for disseminating the doctrines of dispensationalism—a key feature of much fundamentalist thought. Dispensationalism is a method of biblical interpretation that sees history in moral decline (contrary to the optimism of liberal Protestantism). At the end of the age of the church, there will be greater immorality and apostasy, followed by Christ’s return and the Day of Judgment. Dispensationalism not only helped people interpret history, it provided a ready incentive for evangelism and missions. James M. Gray, a minister in the Reformed Episcopal Church, was the first dean and president of Moody Bible Institute. He began his duties in 1904 and directed the Chicago school until his death in 1935. Gray was not the most visible fundamentalist, but he regularly invited prominent fundamentalist leaders to speak at Moody. He made sure his students received a steady diet of arguments, usually grounded in dispensationalist theology, against liberal theology. Gray was one of the first conservatives to reply to Harry Emerson Fosdick’s provocative sermon, “Shall the Fundamentalists Win?” Fosdick had argued that doctrines such as the Virgin Birth, the Second Coming, and inerrancy were minor points that should not jeopardize church unity. In his response, Gray reaffirmed traditional Protestant doctrines in light of dispensational thought. He then added that if liberals “had not sought to introduce their strange and subversive doctrines among God’s saints,” fundamentalists would not have needed to “contend for the faith delivered to them once for all.” Gray argued it was liberals who were disrupting the churches, not fundamentalists, who were simply preaching and writing what Protestants had always believed. Fosdick preached his famous sermon against fundamentalism at New York City’s First Presbyterian Church, a congregation within the same denomination (the Northern Presbyterian Church) in which Clarence Macartney (1879- 1957) ministered. Macartney’s opposition to modernism arose not so much out of worries about America’s social fabric or dispensational thought but Calvinist theology (with its concern for the sovereignty and glory of God) and Presbyterian polity (with its dependence on historic creeds). Macartney had his Presbyterian credentials in order. He graduated from Princeton Seminary, and he pastored prominent Presbyterian congregations in Philadelphia and Pittsburgh; he also served on the board of trustees of his alma mater. He became moderator of the Northern Presbyterian Church’s 1924 General Assembly, the only fundamentalist to be elected to that post. Macartney also argued that the creed of Presbyterians (the Westminster Confession) was not an “outworn interpretation of theology,” a common liberal complaint. Instead, it constituted “the foundation upon which stands the Christian Church.” By requiring Presbyterian ministers to subscribe to the creed, the church was not putting up unnecessary barriers but only requiring what the Bible clearly taught. Macartney believed that because of its confessional tradition the Presbyterian Church was “destined to be the leader in the conflict.” Never had Presbyterians a greater opportunity to serve Christ’s kingdom than by defending and affirming their confession of faith. Macartney’s words were pro-phetic. A former fellow classmate at Princeton Seminary, J. Gresham Machen, eventually led conservatives out of the Northern Presbyterian Church and offered theological ammunition to fundamentalists of all Christian communions. Fundamentalists were united in opposing modernism but not in identifying modernism’s guiding ideas or gravest consequences. Fundamentalism, then, sounded more like a mixed jazz quartet than the tenor solo sung during Sunday morning worship. The melody of fundamentalism consisted in pointing out the errors of liberalism but its proponents could not resist the chance to improvise on that melody. D. G. Hart is librarian and associate professor at Westminster Theological Seminary in Philadelphia, Pennsylvania. He is author of Defending the Faith: J. Gresham Machen and the Crisis of Conservative Protestantism in Modern America (Johns Hopkins, 1994). Two of the least known but most effective early evangelists. Ethnic and religious tensions ran high in Jesus’ day too.